I am always keeping an eye out for news on remote presence products for you my dear readers. After the vGo got some major visibility with the Today Show piece and the Business Week article, it is getting a bit quiet. But here are some fun links I found. The love child of Eve and Wall-E? Hear here – (SF Gate) Daniel Yates, CEO of software startup Opower called his newly purchased Anybot QB “Skype on a Segway.” So, while I am personally not a fan of that description, it seems to help people understand the concept initially. I look forward to the conversation Anybots will have with him after using it for a while. 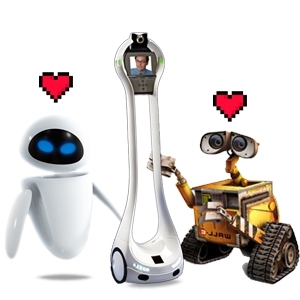 Robo-Romance: Wall-E and Eve had a love-child. His name is Vgo. – (Geek Chic Daily) I could not pass this one up. Way too much fun to see their take on the origin of the VGo (see the image above). 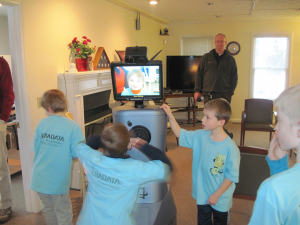 Technology Fans Come in All Sizes – (Wright State) FIRST Logo Team students visiting the Living Laboratory at the Nursing Institute of West Central Ohio got some hands-on time with the RP7i both at the lab and at InTouch Health’s office in Santa Barbara, California. There are a number of other robotic components being tested at the Living Laboratory including the PARO Interactive Pet. This entry was posted in Anybots, Anybots QB, Elder care, Health Care, Industries, Intouch Health, Remote Presence Links, Remote Presence Systems, RP7i, RPS Companies, VGo, VGo Communications and tagged Anybots, Anybots QB, InTouch Health, Living Laboratory, RP7i, vgo, VGo Communications. Bookmark the permalink.